Hello everyone, my name is Colin. I live in a small fishing village called Tideswell. 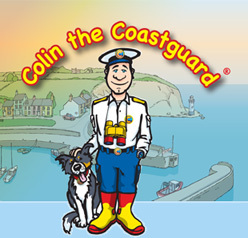 I work as a Coastguard with my dog Rocky. I have to make sure that people are safe when they are at sea, on the cliffs or on the beach. If anyone is in trouble I can contact my friends who are always ready to help.